1Molecular Diagnostic and Personalized Therapeutics Unit, College of Applied Medical Sciences, University of Ha’il, Kingdom of Saudi Arabia. 2College of Nursing, University of Ha’il, Kingdom of Saudi Arabia. 3Ha’il Maternity Hospital, Kingdom of Saudi Arabia. The increasing prevalence of nosocomial pathogens in hospital environment has become a serious concern with significant morbidity, mortality and high cost burden on society and health care systems worldwide. This increase has been mainly associated with increased health care-associated infections (HAIs), a surge of antibiotic use and new developments in life saving medical practices. The problem is further complicated by the emergence of difficult to treat multidrug-resistant (MDR) micro-organisms. In order to control and reduce the prevalence of nosocomial pathogens within healthcare settings, it becomes imperative to acquire the knowledge about the source and transmission of these difficult to treat pathogens. The aim of this study was to screen the patients, staff and the environment of Maternity Hospital in northern part of Saudi Arabia. In this study, 878 swabs were collected from a range of body sites from patients, staff and from the hospital environment like walls, beds, taps, computer keyboards and ventilator surfaces. The isolated bacterial strains were identified by conventional methods as well as by automated methods, including MALDI-TOF-MS and Microscan. Furthermore, the antimicrobial susceptibility was performed by Microscan. In this study, 157 different bacterial strains were isolated including, S. aureus (32.48%), E. coli (19.74%), K. pneumoniae (32.48%), Enterobacter spp. (5.73%), Citrobacter (0.63%) and P. aeruginosa (8.9%). Among these bacterial isolates, 41.4% were found to be in staff, 56.6% in patients and 1.9% in hospital environment respectively. The antibiotic susceptibility results revealed that, 57% and 43% of MRSA were found among staff members and patients respectively. All (100%) Extended spectrum â-lactamase (ESBL) positive E. coli and 91% ESBL positive K. pneumoniae were found among patients respectively. The findings of current study showed a high percentage of nosocomial pathogens prevalent in Maternity Hospital in Ha’il region of Saudi Arabia. Additionally, a high percentage of multi drug resistant strains from both patients and staff members further stresses on the importance of surveillance and effective infection control strategies to be implemented among the hospitals and healthcare facilities in Saudi Arabia. Keywords: Nosocomial pathogens, Antimicrobial Resistance, Microbial Identification. Nosocomial infections are the infections acquired by patients in a hospital or other health care centers and are identified at least 48-72 hours following admission of patients to health care facility1-2. Urinary tract infection (UTI), surgical-wound infection, pneumonia, and bloodstream infection (BSI) are the most common categories of nosocomial infections reported. Most of the micro-organisms including, bacteria, viruses and fungi are very well capable of causing nosocomial infections; however, some of them have been found more frequent than others. The common bacterial pathogens which have been found to cause nosocomial infections most often are Staphylococcus aureus, Coagulase-Negative Staphylococci (CoNS), Pseudomonas aeruginosa, Klebsiella pneumoniae, Escherichia coli, Clostridium difficile, Enterobacter spp., Enterococcus spp., and Acinetobacter spp.3-5. With increasing use of antimicrobial agents and advancement in life saving medical practices which expose the patients for invasive procedures, the nosocomial infections have become more prevalent. Nosocomial infections are one of the major cause of mortality and morbidity affecting huge number of patients worldwide and according to WHO report, an approximately 15% of all hospitalized patients suffer from these infections6-7. The nosocomial infections among the neonates are very troublesome because these infections are responsible for 4%–56% of all death causes in neonates. The incidence rates of mortality among neonates due to nosocomial infections are very high in South-East Asia and Sub-Saharan Africa8. The different sources of nosocomial pathogens are patients, hospital staff and the hospital environment including air, water, walls, floor, windows, beds, baths, toilets and other medical devices9. Nosocomial infections are commonly transmitted due to lack of effective infection control because the hospital staffs do not follow a correct hygiene maintenance plan regularly. As the staff in the hospital commonly moves from one place to another and from one patient to another, they may serve as a vector for transmission of infection. Additionally, the visitors to the admitted patients are also an active vector for transmitting the nosocomial infections. Additionally, increased use of out-patient treatment in recent time means that a greater percentage of people who are hospitalized today are likely to be seriously ill with more weakened immune systems than in the past10. Moreover, some medical procedures bypass the body’s natural protective barriers and cause some serious infections. Nosocomial pathogens have shifted away from easily treatable bacteria towards more resistant bacteria because of extensive use of large number of antimicrobial agents11. The burden of healthcare-associated infections and increased morbidity and mortality due to nosocomial bacteria acquired during hospital stay has been reported worldwide12-15. In order to control and reduce the prevalence of nosocomial pathogens within healthcare settings, it becomes imperative to acquire the knowledge about the source and transmission of these difficult to treat pathogens. The aim of this study was to screen the patients, staff and the environment of Maternity Hospital in northern part of Saudi Arabia. In this study, 821 swabs were collected from the Hail Maternity Hospital, Saudi Arabia between March and April 2013. Swabs were collected from a range of body sites including, nose, rectal, umbilical, throat, skin and wound infections; from patients (365), hospital staff (414), and from the hospital environment like walls, beds, taps, computer keyboards and ventilator surfaces (42). The swabs were processed in the Microbiology Laboratory and the bacterial isolates were cultured during 24-48 h at 37°C on 5% sheep blood agar, chocolate agar, and Mac- Conkey agar. Growing colonies were checked for mixed cultures, transferred to a new plate and the isolates growing in pure culture were subsequently conserved in at 80°C until use. After Gram staining and determination of catalase and oxidase activities, bacterial isolates were identified using PHOENIXH identification cards (BD Diagnostics, Sparks, MD, USA) or APIH identification strips (bioMe´rieux, Lyon, France), both according to the manufacturer’s instructions. Additionally, Slidex Staph Plus (bioMe´rieux, Lyon, France) was used for Staphylococcus aureus identification. All bacterial strains were examined by MALDI-TOF-MS16 using a Microflex LT instrument (Bruker Daltonics, Germany), Flex control 3.0 software and the Biotyper 2.0 database (Bruker Daltonics). These instruments were used to calculate and process the analytical data according to the manufacturer’s instructions. In this method, a fresh colony material was smeared on a polished steel target plate (Bruker Daltonics) using a toothpick, overlaid with 1 ìl of a saturated a-cyano-4-hydroxy-cinnamic acid (HCCA) matrix solution in 50% acetonitrile-2.5% trifluoroacetic acid (Bruker Daltonics), and air dried at room temperature. For the direct transfer-formic acid method, 1 ìl of 70% formic acid was added to the bacterial spot and allowed to air dry before the matrix solution was added. The Bruker bacterial test standard (Bruker Daltonics) was used for calibration according to the instructions of the manufacturer. For each strain, two preparations of colony/sample material were analyzed. Standard Bruker interpretative criteria were applied to compare the data obtained with reference data base. Briefly, scores of e”2.0 were accepted for species assignment and scores of e”1.7 but <2.0 for identification to the genus level. 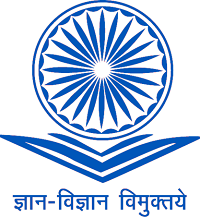 Scores below 1.7 were considered unreliable. Microscan walkaway (Siemens Healthcare Diagnostics, Sacramento, CA, USA) is an automated system used for bacterial identification and antibiotic susceptibility test. A small portion of a well isolated colony was taken and added to a Gram-positive or a Gram-negative Microscan combo panel. The panel was loaded into the Microscan walkaway machine according to the manufacturer’s protocol. Results were available after 24- 48 hrs. In this study, 878 swabs were collected from a range of body sites from patients, staff and from the hospital environment. The identification from the positive samples showed, 157 different bacterial strains were isolated including, S. aureus (32.48%), E. coli (19.74%), K. pneumoniae (32.48%), Enterobacter spp. (5.73%), Citrobacter (0.63%) and P. aeruginosa (8.9%) as presented in Table 1. Among these bacterial isolates, 41.4% were found to be in staff, 56.6% in patients and 1.9% in hospital environment respectively. The antibiotic susceptibility results revealed that, among 157 bacterial isolates, 19% (30/157) were found to be MRSA, 12% (21/157) MSSA, 17% (26/157) E. coli-ESBL-positive, 3% (5/157) E. coli-ESBL-negative, 30% (46/157) K. pneumoniae-ESBL-positive and 3% (5/157) K. Pneumoniae-ESBL-negative isolates, respectively. 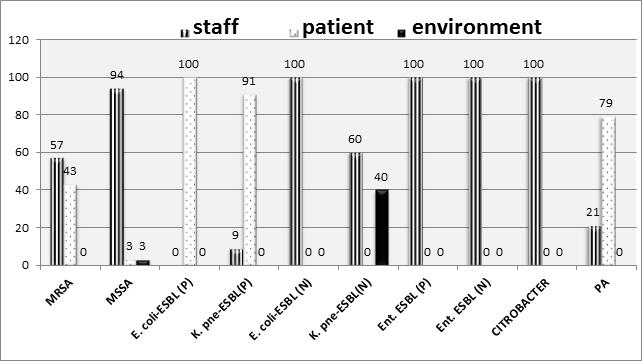 Furthermore, the distribution of resistant strains among patients, staff and environment are shown in Figure 1. 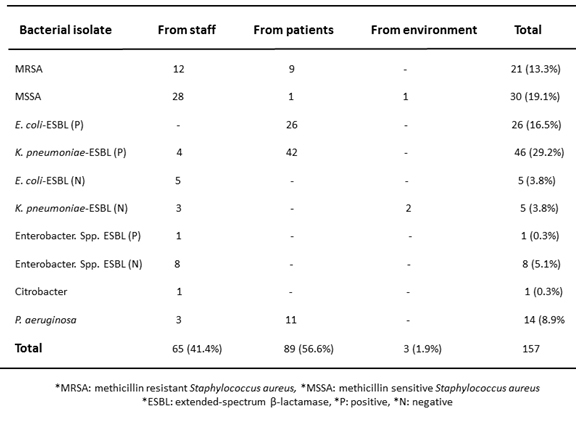 The results of resistant bacterial strain distribution showed that, 57% of MRSA were found among staff members and 43% MRSA were found to be present among patients respectively. However, 94%, 3% and 3% MSSA were found to be present in staff, patients and environment respectively. All (100%) Extended spectrum â-lactamase (ESBL) positive E. coli and 91% ESBL positive K. pneumoniae were found among patients respectively. Nosocomial infections are on the rise and they pose a serious threat to patients and the healthcare professionals. Staphylococcus aureus, Coagulase-Negative Staphylococci (CoNS), Pseudomonas aeruginosa, Klebsiella pneumoniae, Escherichia coli, Clostridium difficile, Enterobacter spp., Enterococcus spp., and Acinetobacter spp. are common bacterial pathogens capable of causing nosocomial infections 3-5. The results of current study showed a high prevalence of nosocomial bacterial isolates among the patients and hospital staff in Ha’il Maternity hospital. In this study, 878 swabs were collected from a range of body sites from patients, staff and from the hospital environment. The identification from the positive samples showed, 157 different bacterial strains were isolated including, S. aureus (32.48%), E. coli (19.74%), K. pneumoniae (32.48%), Enterobacter spp. (5.73%), Citrobacter (0.63%) and P. aeruginosa (8.9%). The results of our study were slightly different compared to a study conducted as one year surveillance in a military hospital in Saudi Arabia by Moataz et al. 2005. In his study, MRSA was found to be the most common (10.2%)17. Additionally in another study from the KSA, the most prevalent nosocomial pathogen was found to be MRSA (31.7%)15. Nosocomial pathogens are slowly becoming difficult to treat organisms due to the appearance of highly resistant strains, because of higher number of antibiotic usage in the hospitalized patients11. Methicillin resistant S. aureus and ESBL positive E. coli and K. pneumoniae are at rise among the hospitalized patients. The antibiotic profiling of the nosocomial pathogens in the current study showed a high prevalence of MRSA from both hospital staff as well as from the patients. 57% of MRSA in our study were found to be among the hospital staff and 43% among the patients. The results of our study were in agreement with a study from India in which 55% of MRSA were reported from the hospital staff and 45% from the patients18. Extended spectrum ß-lactamases (ESBLs) positive K. pneumoniae and E. coli have emerged as most prevalent nosocomial pathogens among the Gram-negative rods (GNR) worldwide. These pathogens have been reported from the patients, hospital staff as well as from the hospital environment. In our study, 46% K. pneumoniae and 26% E. coli were found to be ESBL positive. Furthermore, the distribution of these ESBL positive strains showed that 100% ESBL-E. coli and 90% ESBL-K. pneumoniae were from the patients and 9% ESBL-K. pneumoniae were from the hospital staff. The results of our study showed a high prevalence of nosocomial pathogens from patients, hospital staff as well as from the hospital environment in Maternity hospital, Hail, Saudi Arabia. Furthermore, highly resistant strains like MRSA and ESBL-positive E. coli and K. pneumoniae in our study confirms that the hospital workers may be acting as a vector for the transmission of these difficult to treat pathogens in the hospital settings. In order to control the nosocomial infections, the surveillance strategies along with the antibiotic prescription guidelines as well as the efficient infection control programs should be implemented. This study reveals a high percentage of prevalence of nosocomial pathogens from patients, hospital staff as well as from the hospital environment in Maternity hospital, Hail, Saudi Arabia. Furthermore, highly resistant strains like MRSA and ESBL-positive E. coli and K. pneumoniae in our study confirms that the hospital workers may be acting as a vector for the transmission of these difficult to treat pathogens in the hospital settings. This study highlights the need for strengthening nosocomial infection prevention and control programs, monitoring antibiotic prescription policies at each facility, and implementation of surveillance and effective infection control programs in the hospitals across the Saudi Arabia. This study was funded by a research grant from Ha’il University. Hassan, A.K., Fatima, K.B., and Riffat, M. Nosocomial infections: Epidemiology, prevention, control and surveillance. Asian Pacific Journal of Tropical Biomedicine, 2017; 7(5): 478-482. Saracali, M.A., Baysallar, M., and Gun, H. “Nosocomial uropathogens and their antibiotic susceptibilities in a Turkish Military Hospital: a prospective and microbiological study. Turkish Journal of Medical Sciences, 1999; 29(2): 165–168. Chen, Y.C., Lin, C.F., Rehn, V.F., et al. Reduced nosocomial infection rate in neonatal care unit during 4-year surveillance period. Rev. J. Chin Med Assoc, 2017; 80(7): 427-431. Hamed, G., Hamid, V., Samira, K., and Ebrahim, S. The Antibiotic Resistance Profiles of Bacterial Strains Isolated from Patients with Hospital-Acquired Bloodstream and Urinary Tract Infections. Critical Care Research and Practice, 2012: 890797. Khan, M.A., Hays, J.P., Elabbasy, M.T., and Al –Mogbel, M.S. Rise of Clostridium difficile infections: an overview. Reviews in Medical Microbiology, 2017; 28: 152 -157. Ozer, T.T., Deveci, O., Yula, E., Tekin, A., Yanik, K., and Durmaz, S. Nosocomial infections in a district hospital in Turkey. Biomed Res, 2015; 26(2): 299-303. Emily, R.M,. and Sydnor, T.M.P., Hospital epidemiology and infection control in acute-care settings. Clin Microbiol Rev, 2011; 24 (1): 141-173. Anita, K.M. Z., Shally, A., and Janaka deSilva, H. Burden of infectious diseases in South Asia. BMJ, 2004; 328(7443): 811–815. Ducel, J.F., and Nicolle, L. Prevention of hospital-acquired infections. WHO, Geneva (2002). Hassan, A.K., Aftab, A., and Riffat, M. Nosocomial infections and their control strategies. Asian Pac J Trop Biomed, 2015; 5(7): 509–514. Jain, A., Awasthi, A., and Kumar, M. “Etiological and antimicrobial susceptibility profile of nosocomial blood stream infections in neonatal intensive care unit,” Indian Journal of Medical Microbiology, 2007; 25(3): 299–300. Gastmeier, P. Nosocomial infection surveillance and control policies. Curr Opin Infect Dis, 2004; 17: 295—301. Nyamogoba, H., and Obala, A.A. Nosocomial infections in developing countries: cost effective control and prevention. East Afr Med J, 2002; 79: 435—441. Hanan, H.B., Gwen, C., Fong, K.C., Christine, F., Daifallah, J. A., Maha, A.A., and Ziad, A.M. Hospital- and community-acquired infections: a point prevalence and risk factors survey in a tertiary care center in Saudi Arabia. International Journal of Infectious Diseases, 2006; 10: 326-333. Sherifa, M.S.A., and Moataz, M.A.F. Epidemiological and Microbiological Profile of Nosocomial Infection in Taif Hospitals, KSA (2010-2011). World Journal of Medical Sciences, 2012; 7 (1): 01-09. AlMogbel, M.S. Matrix assisted laser desorption/ionization time of flight mass spectrometry for identification of Clostridium species isolated from Saudi Arabia. Braz. J. Microbiol 2016; 47: 410e413. Abdel-Fattah, M.M. Surveillance of nosocomial infections at a Saudi Arabian military hospital for a one-year period. Ger Med Sci, 2005; 3: Doc 06. Fatima Khan., Indu Shukla., Meher Rizvi., Asfia Sultan., Praveen Kumar., Tariq Mansoor., and Satish Chandra Sharma. Screening For Detection of MRSA in Patients and Hospital Staff of a Tertiary Institutional Hospital. Int. J. Curr. Microbiol, 2013; 2(12): 569 574.